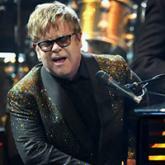 Elton John kicked off a new residency in Las Vegas Wednesday night, unveiling The Million Dollar Piano at the Colosseum at Caesar's Palace. The award-winning singer-songwriter has returned to Las Vegas for a three-year, headlining gig at Caesars, a follow-up to The Red Piano, his hit show that ran for five years and ended in 2009. "This isn't like the old days," John told the audience of the new show. "It's going to be certainly different from anything you've seen from me before." The new production is named for a custom Yamaha grand piano that required four years to build. Nicknamed Blossom (after jazz singer Blossom Dearie), the instrument has dozens of LED screens embedded into its side that showcase videos and related imagery during John's performance. "It has a spin-cycle washer in the back, a microwave and an aquarium," he quipped to the crowd, adding that the only thing missing is "a barbecue." During his two-hour performance, the celebrated entertainer performed 19 songs from his lengthy catalog of hits, which includes popular tracks like I'm Still Standing, Rocket Man, Bennie and the Jets, Tiny Dancer and Saturday Night's All Right (For Fighting). In between songs, he discussed individuals who had inspired him over the years, from John Lennon and Nelson Mandela to Leon Russell and writing colleague Bernie Taupin. The Rock and Roll Hall of Famer is slated for 15 more performances through October and expected to return in February for more shows. As with Red Piano, for which John had originally only signed on for three years, organizers are considering extending Million Dollar Piano's run. "I think it's very possible, both on duration and number of shows," said Jason Gastwirth, senior vice president of entertainment for Caesars Entertainment Corp. "There's been such a large appetite by his fans to come see the show."